I visited the Desert Research Foundation of Namibia in Windhoek, and had discussions with Dr. Joh Henschel, on cooperation and information exchanges concerning research. The on-site education was conducted in Puros, where YOSHIDA Mifuyu, a graduate student of ASAFAS, is doing research on the relationship between the behavior of elephants, natural environments, and human activities in the desert area. The animals live in the forest distributed only along the river. The merit of elephants for people has recently changed from hunting to tourism and the population of both elephants and people are on the increase in Puros. The destruction of vegetation has been recently expanded by elephants. The relationship between elephants and people will perhaps be changed in the future because the recent regeneration of forest is not proceeding due to desertification. Ms. YOSHIDA has begun to write a paper on the relationship between elephants and people and the changes in nature, ecology, and community. I collected documents on the natural environments of the Democratic Republic of the Congo and Cameroon in Paris. I also preliminarily researched the environmental change caused by tourism development at a seaside area in Thailand. I will perhaps carry out comparative research on environmental change between Africa and Asia in the future. 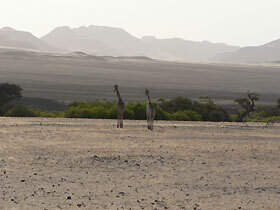 In the severe environment of an arid area, slight changes in the environment may produce large changes. An environmental change inducing a chain reaction is increased by the synergistic effect and affects the wider area by the general circulation of the atmosphere. Therefore, the grasping and investigation of the dynamic relationship between natural environments and human activities are very important, not only for local people but also for people around the globe. In arid areas of Africa, the influence of climatic change upon the local environments and ecosystems has not been made sufficiently clear. In the environmental system consisting of climate, topography, vegetation, soil, and wild animals, subtle change may greatly affect human activity, and this is common to all areas of the world. 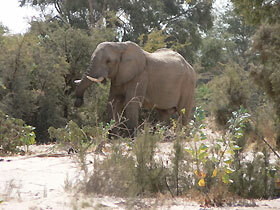 It is hoped that studies on natural environments in Africa will become more active.